Next time if you search for any major brand on Google, you might see Google+ Brand Page in search results. Currently very few brands like AT&T, Toyota, Lexus have their brand pages appear in Google search results. As per many Tech Website like Mashable and CNET, it could raise to charges of anti competitive behavior against Google. Google+ Plus Brand Pages were launched couple of months ago with main objective of connecting brands with their customers in a more effective way than Facebook Brand Pages. Increasing popularity of Google+ Brand pages can be understood by the fact that companies like IBM and Vodafone have a official Google+ Brand Page but no official Brand Page on Facebook. I did a search on few of the brand on Google+ and here are the results. For e.g. 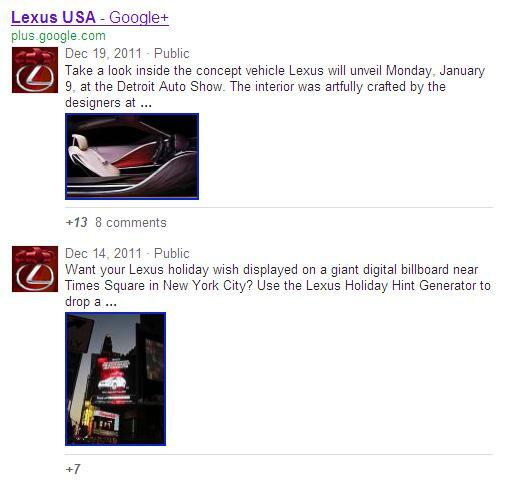 When I searched for Lexus, its Google+ Brand Page was shown in Google search results with excerpt from two of the recent posts. You can also see the popularity of that particular post by the +1 count and no. of comments. Also if there is any image posted with that post, it will also appear as thumbnail in search results. I was expecting the search result to show the latest post but when I visited the Official brand page, there were already 2-3 new posts. Similar results were noticed for search for AT&T and TMobile. Using this new update, now brands have already starting posting updates about news and other offers. This will result in increasing more followers of a brand on Google+. Earlier if you would search for any brand on Google, most likely you would see the home page of that brand or the latest news about that brand. But now with Google+ Brand Pages appearing in search results you get to know the latest update sometimes even before the news is available on another blogs or news websites.